The latest issue of the Automotive News Europe monthly magazine goes live on Monday, October 2. 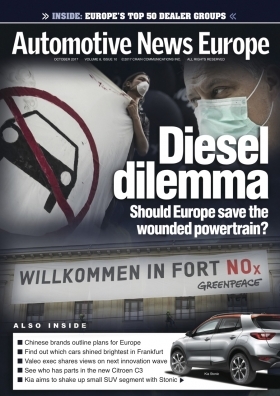 The new edition looks at whether the diesel powertrain -- which automakers say is crucial to reaching tougher EU clean air targets that take effect in 2021 -- has a long-term future. The diesel has been hampered by the Volkswagen Group’s 2-year-old emissions-cheating scandal and stung by the rising risk that the powertrain will be banned from key city centers in Europe. As a result, European sales of cars with diesel engines are falling fast in key markets. Brussels has warned that Germany, the UK, France, Italy and Spain all face an impending infringement procedure for persistently failing to live up to clean air requirements in place since 2010. The responses from the five member states are under assessment by the Commission to decide on the next steps. Those could include referring the matter to the European Court of Justice, where hefty fines could be imposed. Our cover story looks at whether the battered powertrain can survive. We also review the state of diesel sales in Europe’s four largest markets -- Germany, UK, France and Italy. Since arriving at Audi from Volvo earlier this year, Peter Mertens has had to move fast. Audi is striving to take the early lead in the race to offer autonomous driving technology with the Level 3-capable A8 sedan and plans to debut at least one full-electric car each year from 2018 until 2020. We spoke with Mertens about Audi’s ambitious plans. Aston Martin is on the verge of achieving full-year profitability for the first time in a decade. CEO Andy Palmer’s turnaround of the company’s finances is expected to continue with help from a new version of the Vantage supercar and the debut of the brand’s first SUV. Aston Martin, however, faces uncertainly because of Britain’s forthcoming exit from the EU. Chinese automakers are setting their sights higher in their latest attempt to establish a foothold in Europe. The new attitude was on display at last month’s Frankfurt auto show, where automakers such as Great Wall Motor and Chery Automobile signaled their intent to sell sophisticated SUVs in Europe in the next few years. While the Chinese used Frankfurt to gauge reaction to their European plans, most established brands used the event to show off their future electric vehicles. We picked six head-turning battery-powered concepts to highlight. New models, increased technology and a strong focus on personalization are helping volume automakers such as Volkswagen, Ford and Nissan boost sales and improve their bottom lines in Europe’s most competitive segment. We look at what’s driving big changes in the subcompact sector. Kia sees the new Stonic subcompact crossover as a great opportunity to win over European customers who remain loyal to traditional German, French and Italian volume brands. Meanwhile, VW is re-positioning the Polo subcompact to appeal to younger buyers, abandoning an approach in which its No. 2-selling model was a catch-all model for customers who couldn’t afford the larger Golf compact. For the second year in a row, the U.S. retail giant Penske Automotive was Europe’s largest dealer group. According to data compiled by research firm ICDP for Automotive News Europe, Penske sold 183,916 new and used cars in Europe last year, generating 6.75 billion euros in revenue. The largest dealer group in terms of unit sales was the UK’s Arnold Clark with 278,045 units. We provide an analysis of Europe’s retail landscape. In our Final Word column, we review what the move to electric cars will mean for both car designers and developers.